Harrah’s Lake Tahoe is as impressive as Lake Tahoe itself. The 18-story casino hotel features 500 guest rooms, six restaurants, swimming pool, luxurious spa and a first-rate casino action. Innovative theme parties are their specialty (an 18,000 sq. ft. Special Events Center). Enjoy legendary entertainment and performances by big-name stars, as well as free live entertainment at Casino Center Stage. 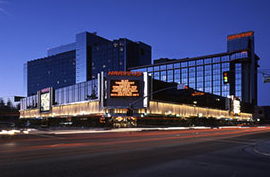 Harrah’s Lake Tahoe offers a great Lake Tahoe casino experience paired with the most exciting 24-hour casino action, entertainment and nightlife!